Henk Helmantel mainly paints church-interiors and still lives. Experts call him a master of realism or one of the ‘northern realists’. The still-lives certainly are realistic. Thirty paintings by this contemporary Dutch artist are grouped around four themes: tranquility, harmony, belief and inspiration. Helmantel’s Protestant belief plays an important part in his life. Yet visitors do not notice many religious symbols in his works. What does strike them: his church interiors and still lives are part of a tradition which can be traced back to the Dutch Golden Age. Helmantel himself admits, Rembrandt is one of the painters he greatly admires. Like a few Dutch Golden Age artists, Helmantel does not paint exuberant still lives; quite the opposite. His still lives contain a bowl with a few eggs; a few bottles or a can and some fruits or nuts. A few of the objects in the paintings are displayed in this exhibition. Helmantel and his wife collect antiques and some of their finds end up in paintings. There is a Chinese chest, as well as bottles and white Delftware. Visitors can also hear music Helmantel listens to, while creating his art. Helmantel occasionally creates different versions of the same composition. Visitors will come across a painting of fresh fruits. 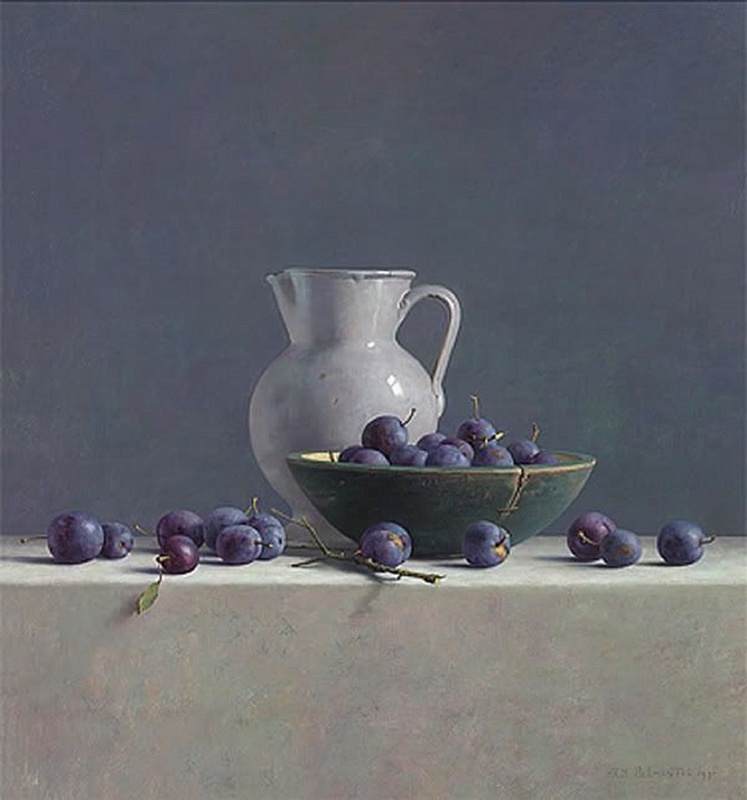 Another painting shows the same composition, but with shriveled fruits. Some Dutch museums and art critics called Helmantel’s works repetitive. At least one museum refused to buy his art. Since 2008, when Helmantel was elected ‘artist of the year’, this slowly changed. One unique painting shows a pair of red shoes. The painting reminds one of works by another Dutch artist: Jopie Huisman. Huisman was self-taught, but Helmantel attended the Academie Minerva in Groningen, where he became part of the group called ‘Northern Realists’. The red children’s shoes are the first pair of shoes worn by Helmantel’s eldest son. Visitors learn more about this work and a few other paintings, in a video. The video is shown at the end of this exhibition; inside the museum’s open depot, which itself is worth a visit. In the video, Helmantel explains how this painting together with nearly all works in his exhibition space in Westeremden, was stolen a few years ago. This specific painting has great emotional value. Fortunately, the work was recovered undamaged. Tranquility, harmony, belief, inspiration, peace are words which seem somewhat dated these days. Yet, they reflect Helmantel’s art. Deceptively simple and stark – yet captivating and arresting visitors. By now, the art world is quite impressed with Helmantel’s art. Two Dutch museums show his art at this very moment. There is this exhibition at Museum Gouda, while another exhibition at Gorssel runs till 13th of May. From the 3rd May, Helmantel’s own museum will reopen after its usual winter-closure, with an exhibition of works by himself and other artists. If visiting the museum for Pieter Pourbus, make sure to also visit Henk Helmantel’s tranquil and harmonious still-lives and church interiors.